Hand made in Italy, the sandals are crafted using the finest of Tuscan leather. The key component is the silk scarf however, which gently drapes around the ankle. With a range of over 28 designs and colours, I can’t imagine these unique sandals failing to complement any summer wardrobe. 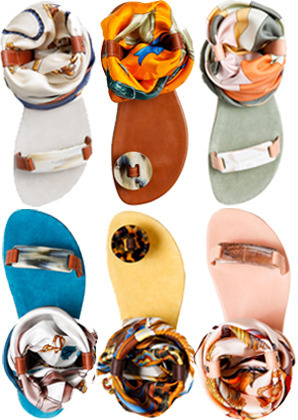 Totally chic and totally classic, these sandals are semplicemente bella! Click here to view Avéc Moderation’s Spring – Summer 2012 range. This entry was tagged avec, fashion, italian, moderation, sandals, scarf, summer. Bookmark the permalink.